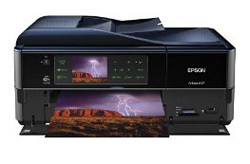 About.com has tested an inkjet printer from Epson called Epson Artisan 837. This color printer supports automatic duplexing and comes with a 30 page ADF in addition to a large touch panel. About.com ends up giving the Artisan 837 a very good review with an overall rating of 5 out of 5 possible stars. The reviewer does not find any major flaws with this Epson printer and enjoys all the features and its excellent print quality. It is also very easy to use. Read the full review of the Epson Artisan 837 All-in-One color inkjet printer here.